Scribner State Airport (IATA: SCB, ICAO: KSCB, FAA LID: SCB) is three miles southeast of Scribner, in Dodge County, Nebraska. Scribner State Airport covers 789 acres (319 ha) at an elevation of 1,325 feet (404 m). It has two concrete runways: 17/35 is 4,200 by 75 feet (1,280 x 23 m) and 12/30 is 3,199 by 60 feet (975 x 18 m). In the year ending August 22, 2007 the airport had 2,600 aircraft operations, average 216 per month: 96% general aviation and 4% military. 21 aircraft were then based at the airport: 67% single-engine and 33% ultralight. Scribner State Airport was built in 1942 as a United States Army Air Forces training airfield. The 2,060-acre (8.3 km2) site is south of the Elkhorn River and is surrounded by low rolling hills on the east, north and west. The area is agricultural. The first news that Scribner Army Airfield would be built came on 1 October 1942, with eviction notices given to area farmers shortly thereafter. Construction soon began, with two runways completed by 26 November 1942. 87 buildings and structures were built. The base opened on 9 December 1942. Scribner AAF was one of eleven training airfields in Nebraska, and came under the command of Second Air Force. 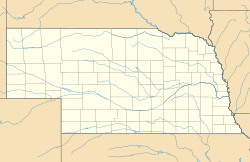 It was initially a satellite base to Sioux City Army Air Base, Iowa, though by 1943 it became an independent base, with Ainsworth Army Airfield, Nebraska, being designated as Scribner's satellite. The 4316th Army Air Force Base Unit had host unit responsibilities at Scribner. In December 1942, the Base Commander was Major A. J. Guffanti. Provided Operational Training at Scribner. Scribner also became a camouflage school. By 1943 the entire airfield was camouflaged to look like a farm and small village to prove that an airfield could be hidden from the enemy. The hangar was painted red to resemble a barn, chicken wire was stuffed with green colored spun glass to resemble trees, and a mock silo beside the barn really housed the sliding hangar doors. Another building was given a steeple and painted to resemble a church, and a "school house" was built with spun-glass children. Even the runways were coated with tar and coated with wood chips and ground corncobs, and painted green or brown, depending on the season. The remainder of the former Airfield was rented out. Nebraska Department of Aeronautics continues to operate the airfield, leasing storage and small segments of land to local concerns. A United States Air Force communications center is also located on the site. A few wartime buildings still are in use, along with the remains of the wartime runways. ^ a b c FAA Airport Master Record for SCB (Form 5010 PDF), effective 2009-05-07. ^ Real-McKeighan, Tammy, "Pilots once trained at Scribner Air Base", Military Times, 4 September 2011.